Haven't read the beginning of the story? Start here. Timothy is a fighter. He fought that infection hard. Over the course of about seven days they put him on increasingly higher doses of medication and increasingly more invasive ventilators in an effort to help him in his fight. While he was fighting the infection we weren’t able to hold him at all. All I could do was reach into the side of his incubator and lay my finger on his foot or leg. I would stay by his side for a few hours each day and sing to him. I remember at one point, I was standing at his bedside and only stayed a few minutes before the grief caused by his situation overcame me and I had to leave the room. I knew that there was still a real possibility that my baby could die. 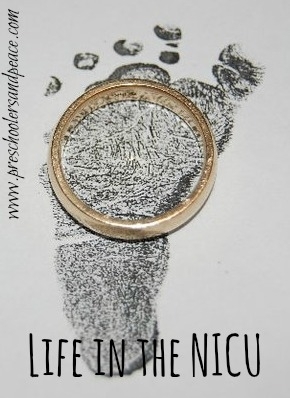 While we had been in the NICU I had already witnessed one family have to say goodbye to their wee little son who was just too little and frail for this world. I knew it could happen. But, one day, we came in to the hospital to the news that Timothy was getting better. His body was responding better. And slowly his lungs started working better. And every day, he gained a few more grams. And every day, he got a little bigger. And every day, he ate a little more. We celebrated when he reached 2 pounds. We cheered when he reached 3 pounds. We started hoping when he reached 4 pounds and by this time was gaining 1-2 ounces per day. By the beginning of December, he was growing and growing, literally before our eyes. We were able to put clothes on him. He was in an open air crib, able to maintain his own body temperature without living in the tropical paradise of the incubator. I was able to hold him freely as long as I wanted. I changed all his diapers whenever I was there. He still needed oxygen, just the tiniest bit. It was almost like it was a crutch for him. They kept trying to wean him off, but he couldn’t get the hang of it. He was starting to take his milk from a bottle, little bit at a time, sometimes tiring before he could finish 15ml. But every day, little by little, he was growing. Until one day, during the middle of December, the neonatologist started talking to me about when we could take him home. The doctor decided that since he was doing so well, except for the oxygen, he would go ahead and discharge Timothy with an oxygen tank until his lungs were finally able to handle breathing completely on their own. I remember very clearly a Friday shortly before Christmas. The doctor told me that Timothy was ready to go home. The words that I had waited to hear for nearly three months. But I was scared out of my mind. I told him that I wasn’t ready yet. Crazy, huh? You’d think that after all that waiting I would have loaded him up into the carseat and taken off! But I had a little guy that was born so fragile. For his entire life I had medical staff keeping an eye on him. If I took him home, it was just going to be me and my husband! What if we made a mistake? What if we didn’t catch something? I told the doctor that I wasn’t ready. He said he wouldn’t push me, to just tell him when I was ready. Over the weekend, I thought and thought. Jeremy and I talked about it and he also didn’t push me, knowing that I needed to be comfortable. I talked to the nurses that were working in his room, who by now were friends. No one pressured me, but I knew that we couldn’t keep him there forever. On Monday morning, I made sure to be at the hospital in time for the doctors’ rounds. When he came into the room I told him that we were ready to bring Timothy home. And so it was decided. They told us that we could take him home the next day. After 87 days and a million dollars, we brought our son, Timothy David White, home, weighing over 6 pounds and the size of a typical newborn. Finally, our family was together again, under the same roof. No more hours spent at the hospital. No more waiting for middle of the night calls that never bring good news. Even as I type this, I am overwhelmed by the memory of that day and the days that followed. I believe it was Kendra that told me to expect a time of transition after we brought him home. The other children needed a chance to bond with the baby. They needed a chance to bond with me again as their primary caregiver. We all needed a chance to just be normal. So, that’s what we did. We weren’t allowed to go anywhere except the doctor’s office and grandma’s house because it was the middle of the winter and if any of us got sick and brought illness into the house, Timothy was at a very high risk of getting sick and ending up back in the hospital. For three months, he didn’t go anywhere. And it was the best thing ever. I stayed home, carrying him in the Moby Wrap, with his portable oxygen tank strapped to my back. Just a couple weeks after Timothy came home. During this time, with a 7 year old, 5 year old, 3 year old and a newborn, we spent a lot of time reading books on the couch. We all took naps in the afternoon. We played lots of games. Note: He only needed the extra oxygen for about six weeks. After several nights of waking up to find that his nasal cannula had come off in his sleep and the apnea monitor never picked up a change in his breathing, we knew he didn’t need it anymore. That little boy, born 1 pound 13 ounces, is now 3 years old, 26 pounds. The Beanie Baby is just a few inches shorter than him. Taken just a few weeks ago after he played in the mud. We prayed earnestly from the beginning of this story that God would use Timothy’s life to bring people closer to Jesus, to understand that we cannot cope with the trial and tragedy of life without the hope that comes from knowing Jesus. I can’t tell you the number of people that have told us that Timothy’s life story woke them up to their need for Jesus. And for that, we give God all glory and praise. After Timothy was born, he was taken out of the operating room to be examined by specialist doctors. He was given lots of drugs to stimulate and protect his lungs. He was intubated so that his lungs could be given assistance in the task of breathing. At only 25 weeks, his lungs should still only have been breathing amniotic fluid, but they were now forced to breathe oxygen and they simply weren’t ready for it. Perspective is difficult, but imagine that he is as long as a big burrito. His little tiny diaper is the size of a pantyliner. Here is an update I posted to Facebook a few hours after Timothy was born. It was very important to me that people know that we were beyond thrilled to add this precious boy to our family. Yes, the circumstances were tragic, but he was still a treasured member of our family, one whom we knew was being used by God for purposes of which we still aren't completely aware. Because I try to find joy in even the smallest things, even this difficult experience couldn't keep my humor down. Our family rejoices in the addition of Timothy to our whanau (which means family in Maori, one of the languages of New Zealand) but we also know that his life is fragile. We pray and beseech and beg God, knowing that God loves him even more than we do and his ways are not our ways. But despite the gravity of the situation my spirits are high so please don't be offended if I'm cracking jokes or just generally acting like myself. It was explained to us that the first 24 hours were incredibly critical, then the next 48 hours and then the first two weeks of his life. So many things could go wrong, so many things. His little body simply wasn’t supposed to be living in this world yet. I just returned from visiting Timothy in the NICU. When I first saw him I cried. He is so very small and they fully expect him to lose 10% of his body weight just like a regular newborn. I wanted to turn my wheelchair right around and go back to my room. But I made myself stay. And as I watched that tiny boy with the hiccups, God's love for that precious one overwhelmed me. That's my boy and I love him. I stayed in the hospital for four days after he was born, recovering from the c-section, pumping milk just as much as I could and spending time by his bedside whenever I could. I wasn’t able to hold him yet at this point. Tomorrow, I go home. I'm excited about living with my family again but now part of our family will be missing and I know that will hurt. Be praying for my heart tomorrow as we move into a new phase of our lives. The day that I walked out of the hospital without a baby in my arms, I cried. Bawled, really. No mother is supposed to leave her baby behind. Timothy was doing well in the NICU. He was intubated for only 12 hours and then was put on oxygen and allowed to breathe on his own. He was stable, eating increasing amounts of breastmilk through a tube in his nose. To give you perspective, his first few few days of food he received 1ml of breastmilk every three hours, which was quickly increased over the next few weeks. So, I left the hospital, without my baby. And every day, my life was the same: Leave for the hospital about 8am, with all the milk that I had pumped the previous 16 hours in a little insulated bag. Arrive at the hospital in time to meet with the doctor and get updated on his care. Sit by his side, singing to him and talking to him. Lots of talking to the nurses. Leave for home about 1pm. On the 25 minute drive home I would start to mentally switch over to being a mom of three. I'd arrive home and get an update from the people caring for my other kids. We'd do family things, spend as much time together, all the while I would be pumping every three hours, desperately trying to provide enough milk for my newborn son. We'd have dinner and put the kids to bed. Often my husband would then go down to the hospital to spend some time by our son's bedside. Every night I would call about 9:30pm to find out his new weight for that night. We cheered for every 15 grams he gained. Then one day, when he was about two weeks old, we received a call early in the morning. The doctor told us that Timothy hadn’t done very well overnight and wanted us to know before we came to visit so that we wouldn’t be surprised when we saw him. When we walked into his room, he was back on a ventilator, unable to breathe sufficiently on his own. It was explained to us that he had developed an infection, something similar to pneumonia. It's not surprising, considering that his skin had been pricked for various blood draws and he had semi-permanent IV lines. Every prick of his skin brought the possibility of introducing infection. This infection had landed in his lungs, probably the most vulnerable part of his body. Looks like Timothy is fighting an infection. They have started him on antibiotics and he is still on the ventilator. Nurse said he just isn't feeling well and so can't keep his stuff together. Her comment was that we are asking him to do things that he isn't supposed to be doing yet and he's tired. Once again, we were faced with the possibility of losing our son. We didn't know if his little body would have the ability to fight the infection. We also were aware that the longer he was intubated the more serious long-term complications he could have had, if he survived at all. We did the only thing we knew how to do: prayed. And prayed some more. I cried out to God through my tears, asking Him over and over why this was happening. I remember standing next to his bed, watching the machine breathe for him, listening to his heart beat on the machine. All I could do was tell God "Please don't let his little life be for nothing. I want your will, not mine." The evening of September 24, two full weeks after that horrible morning when I discovered my waters had broken at 22 weeks, I had a visit in the hospital from a sweet friend that brought me Taco Bell and prayed over me before she left. She laid her hands on my belly, praying for life for my unborn son and peace for me as a I slept. I was encouraged and was able to sleep well. At about 2am on September 25, I woke for some reason, which wasn't unusual considering I was sleeping in a hospital. After a few minutes I realized that I was experiencing what felt like contractions. Instead of panicking, I looked at the clock to note the time. I remembered from my previous three pregnancies that one contraction every 15 minutes or so isn't a concern. More than that means something more important. I watched the clock for an hour and during that time felt about 10 contractions. Nothing painful, but definitely noticeable. The interesting thing about it all was that I had a monitor on my belly, designed to pick up fetal movement and to record any contractions that I had. The monitor wasn't showing a single thing. Part of me wanted to just ignore it, thinking irrationally that maybe it would all go away. Acknowledging what was happening to anyone other than myself meant that it was real. The sane part of me knew that I had to tell someone, so I rang the nurse. When she arrived I told her that I had been experiencing contractions and gave her all the details. She checked the monitor and said that nothing was coming up on the monitor and she seemed a bit skeptical. This is one of those times that I'm thinking - if a pregnant woman is having contractions, but the monitor doesn't pick it up, is she really having contractions? OF COURSE SHE IS. This was my fourth pregnancy. I had experienced labor with all of my previous babies. I knew was contractions felt like. Sure, they were different because my baby was so tiny, but they were still contractions. The nurse said that she'd page the doctor and left. In the meantime, I'm thinking - hmmmm... should I call my husband? No, I think I'll wait. My reasoning was that if I truly had the baby today (a little bit of denial, you think?) he was going to need all the rest he could get. It was still the middle of the night. I decided to let him sleep. All the while, the contractions are coming closer together and with more strength. I'm still timing them and I'm having contractions every 7-8 minutes and I'm needing to breathe through them because they're getting uncomfortable. I paged the nurse again. When she came in and saw that I was now having to breathe through the contractions in order to manage the pain, she started taking me a little more seriously! She paged the doctor again, who had been in labor and delivery, and the doctor came quickly. The doctor, a senior resident who looked like she'd been on duty for at least 24 hours, did a quick internal exam to determine how far along I was. But it didn't matter. I already knew what she'd say. "Michele, you are about 3cm dilated already." Pause. "You know what this means, right?" Head nod from me. "You're going to deliver this baby this morning." From that point on, things around me took on a life of their own. Orderlies were busy packing up all my stuff, nurses were in and out, making sure I was ready to be transferred down to Labor and Delivery. They were all flummoxed over the monitor STILL not tracking my contractions. And I was on the bed, thinking - HURRY! Right after the doctor left, I called my husband and told him what was going on. He quickly went into action, called a friend to come stay with the kids so he could get to the hospital. He also called my parents. I know this, because just a few minutes later I got a call from my dad, who, through his tears, told me that he was praying for me and for our little boy. Hearing my daddy crying over the phone just about did me in. Ok friends get on your knees. I'm in labor and they will deliver me this morning. Pray for God's hand to be on Timothy. I was wheeled into the operating room and hooked up to monitors and drugs were started to numb me. I lay there, numb from the chest down, as people were busy around me. I threw up on the anesthetist. All in a day's work, he told me. We were told in the previous weeks that the choices that the doctors made in how they cared for our son would be determined by how he presented when he was born. If he was born with no or little signs of life, he would be cared for gently and given to us to spend time with him until he passed away. But if he was born with vigorous signs of life, they would do everything they could to keep him alive. The doctors started cutting me open and I felt the tug and pull of their hands. Within a few minutes they announced that they were about to pull our boy out. My husband and I waited and we heard a distinct cry. Our son, Timothy, was born at 8:07am on September 25, 2010, weighing only 1 pound 13 ounces and 13 inches long. He was 25 weeks and 5 days gestation, a full 15 weeks early. The day that Timothy was born was a relief, but also the beginning of another very hard season in our family's life. We didn't know what the future would hold for him - would he be able to see? Would he be able to walk? Eat? Talk? We didn't know. But God did. And we clung to Him tighter than ever before. And so it began, Life in the NICU. After the first night in the hospital, things settled into somewhat of a routine. As much of a routine as can be expected when you're fully expecting to deliver an extremely premature baby literally at any hour. Some of you might be asking - what was going on at home while you were in the hospital, hoping to stay for the next ten weeks? And that is a very excellent question. One that I am so thrilled to be able to answer for you. My family experienced the mighty work of the Body of Christ. We had people from all over volunteering their time and resources in order to care for our family. My homeschool friends had a little meeting to figure out how they were going to help me. I had one friend that coordinated all the care for our children, because my husband still needed to work. We had people coming to our house in the morning and afternoon every week day. We had meals being delivered to our house 3-4 times per week so my husband never had to think about what to feed the family. At the time our children were nearly 7, 5, and 3.5 years old and their little homeschool routine went on as always. They were being picked up for park days and taken on field trips. And even put down for rest time every afternoon! One amazing way that God provided for us was through the mother of a good friend of ours. She had been teaching in Afghanistan and needed to come home for medical reasons. She was staying with her family here in our town and she came to visit me one day in the hospital, very soon after I was admitted. While she was there, I asked her what her living situation was and it was really all up in the air. On the spot, I asked her if she would be willing to come and live with my family, helping to care for the children and keeping our homeschool going. She just happened to be a second grade teacher and our oldest daughter just happened to be in second grade!! Definitely God ordained. While my family was being so lovingly care for by numerous people, I was also being well-cared for at the hospital. Daily, I was visited by the staff obstetricians and various specialists and students. I learned quickly that there is a big difference on the information I got from the specialist obstetricians (perinatologists) and the neonatologists, who would be responsible for caring for my baby once he was born. The perinatologists wanted to get me to 24 weeks gestation, which was only a little over a week away. In their mind, based on research and statistics, this was the point of viability, the point at which the baby had at least a chance of surviving the birth. The neonatologists wanted me to stay pregnant until at least 28 weeks gestation. Statistically speaking, 90% of babies born at 28 weeks or later will survive the birth and be discharged from the NICU after a very lengthy stay. The OB decided to change my due date for some reason, so my gestation was changed from 22 weeks, 5 days, to 23 weeks 3 days. I knew that it really didn't matter what either one of them said. I was going to be pregnant for as long as I was going to be pregnant! Arguing about a certain date on the calendar wasn't going to change anything! So, I settled in for the long haul. If you send Michele to the hospital she probably won't sleep well. If she doesn't sleep well she will probably have a lot of time to think. If she does a lot of thinking, she will start praying for her friends. She will pray and thank her gracious God that her baby boy is still inside her, growing just as fast as he can. She will be comforted to know that God loves him even more than she does. If she is praying, she will begin to be overwhelmed by God's goodness and His provision of many people who will help her family and she will want to get on her knees, but that's forbidden! So she will do it in her mind anyway. Such a rebel! If she is on her knees , figuratively of course, she will remember that another positive thing about being in the hospital is that she doesn't have to clean a bathroom! Woohoo! And since she is in the hospital to rest and help this baby grow, she decides to try to get back to sleep. And the baby grew. And the waiting continued. The morning of September 10, 2010, I woke to something no pregnant woman in her second trimester wants to discover: my waters had broken at 22 weeks gestation. I had previously had no complications whatsoever and all of my pregnancies had been absolutely textbook. Finding my pajamas wet was a complete, and totally unwanted, surprise. I got up, in a bit of a daze, about 6am and walked into the bathroom and sat down on the toilet. When I confirmed what happened, I screamed a primal sound that brought my husband racing to the bathroom. Through my tears I told him what I suspected had happened. He and I both knew what this meant: our unborn baby boy was in grave danger. Our friend arrived, we walked out the door and drove to the hospital just two miles away. I had no idea that it would be weeks before I would come home again, with no baby in my arms. When we arrived at the hospital I was taken to the room where at-risk pregnant women go for weekly stress tests. I got asked the normal 537 questions and was told that the on-call OB doctor was busy with other patients and would be in just as soon as she could. The nurse did test the fluid to see if it was amniotic fluid. The test showed that the pH level was inconsistent with amniotic fluid and I was no longer leaking. This calmed me down a bit, the nursing staff obviously weren’t in a rush, so I relaxed. The nurse said oh, it could be this, it could be that, never really saying one way or the other. I was starting to think that maybe it was okay after all. I even sent my husband off to work since he was only a ten minute drive away. I told him I’d call if anything changed. Not my smartest move ever. I rested on the bed, trying to calm my racing my mind. At some point I turned over onto my side and WHOOSH! The fluid surged out. I frantically called out “It’s gushing! It’s gushing!” The noise in the room silenced. Nothing like a pregnancy crisis in a room full of pregnant women to bring a hush to the room. The nurse rushed over and quickly tested the fluid again and I watched her face fall. I knew what that meant. This was amniotic fluid and my life would never be the same. The staff paged the doctor again, more urgently, and she came shortly afterwards. She was a kind doctor, who gently talked with me to make sure that I understood what was going on and what it all meant. She told me that if my baby was born at 22 weeks gestation he would have no chance of survival. She offered me the opportunity to go home and just let nature takes its course. At this point, she was assuming that I would soon be starting labor since 95% of women give birth within a week of waters breaking. I chose to stay in the hospital, knowing I would be there until our baby was born. Soon after I was admitted to the hospital, a technician came in to do an ultrasound of my uterus to find out exactly how much fluid was left. She was very kind, but very silent. I read over her shoulder as she typed a quick report and I saw her type “1.4 AFI”. I found out later that 1.4 AFI (Amniotic Fluid Index) was the amount of fluid left for my son to breathe. Normal for that gestation period is 14. It was equivalent to a couple tablespoons of fluid. At the end of the day, September 10, I was lying in a hospital bed, flat on my back with a monitor on my belly, listening to the heartbeat of my unborn son, praying that I would stay pregnant for the next 10 weeks. I prayed like I had never prayed before in my life. In the past, in Bible studies or Sunday School, I had been asked to think about how I would respond to a crisis in my life. I always hoped that I would respond in a Godly way, that I would trust God because He loves me. I knew that believers in Christ are not promised an easy life. But I hadn’t really ever been tested that way. Well, that night, I was definitely being tested. As I stared at the ceiling and prayed, I begged God that He would use this horrible, tragic event to bring Himself glory. That if this had to happen, it happened for an eternal reason. That people would KNOW GOD. That my son’s life, however short or long, would be used by God to help other people know Him better and deeper and stronger. I cried. Tears for our son. Tears for myself. Tears for my family. As I went to sleep that night, I was quoting scripture in my head. God’s peace swept over me and I slept to the sound of my son’s heartbeat on the hospital monitor, not knowing if it would be there when I woke.